The Detroit Lions have a new head coach in former longtime New England Patriots defensive coordinator, Matt Patricia. 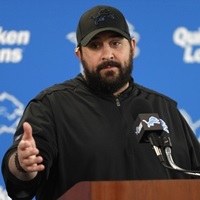 As a first-time head coach Patricia understands that his primary task will be to take the Lions to the postseason consistently and ultimately help them reach and win a Super Bowl. Due to his resume, Patricia will most likely try to accomplish those objectives by building a strong defense and the offense’s ability to control the line of scrimmage. Those are two things that may have curtailed a lot of success in the Motor City in prior seasons and he’s determined to change that, judging by the moves that they made in this year’s NFL draft and in free agency. Quickly improving the defense is a priority for the 43-year-old head coach and the organization and as result, they went out and hired the experienced Paul Pasqualoni as defensive coordinator. The last three years the Lions have invested a lot on their offensive line. This past NFL draft they took Frank Ragnow out of Arkansas in the first round. He’s expected to start right away at either guard or center. Ragnow, selected with the 20th overall pick, was definitely a first-round talent and will help strengthen the Lions front line. The running game is another area where the Lions have invested in during this offseason as they signed LeGarrette Blount, who last year won the Super Bowl with the Philadelphia Eagles. The other running backs available for the Lions are Ameer Abdullah (who last year had ball control issues and fumbled too much), Theo Riddick and rookie Kerryon Johnson who was selected in the second round of the draft with the 43rd overall pick. One of the main reasons for optimism for the Lions is that Matthew Stafford has been playing some very solid football for the last three years and seems to be entering his prime. He is looking more comfortable with his receiving corps. Look for Stafford to be reliable and dependable as a starter this upcoming season and help keep the Lions in playoff contention the whole season. The Lions secondary is excellent with depth at the corners and extremely versatile safeties, which give the Lions a passing defense that can match up with anyone in the NFL. Contrary to previous years the Lions linebackers look like a promising unit this year as they have huge potential with the personnel they have and the players they’ve added. Christian Jones, from the Bears, and Devon Kennard, from the New York Giants, are among those who joined the Lions this year and should help their defensive improvement. Although their defensive line is a cause for concern Patricia will spend many hours trying to tweak it in order to find the right players to drastically improve it as the season goes along. Right now, the Lions don’t have anyone outside of Ezekiel Ansah who can bring the heat from the outside. Under Patricia’s watchful eye look for someone to flourish and emerge for the Lions and fill out that role. Expect the NFC North to be a very tough division this year as both the Minnesota Vikings and the Green Bay Packers look like the top contenders for this year’s division crown. As a result look for the Lions to finish third in the division and miss the playoffs during Patricia’s first year, but expect them to be a serious division contender one year from now.